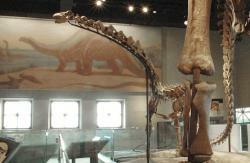 Rapetosaurus krausi: The Cretaceous titanosaur is dwarfed by the massive leg bones of its larger Jurassic cousin Apatosaurus. Field Museum of Natural History.Courtesy Mark RyanPaleontologist Kristina Curry Rogers, a former curator here at the Science Museum of Minnesota, has dedicated much of her career studying sauropod dinosaurs, their behaviors, and the histology of their bones. Sauropods are a diverse group of large, long-necked dinosaurs that include, among others, the popular Apatosaurus (Brontosaurus), Diplodocus, Barosaurus, and Brachiosaurus. The four-legged, herbivorous sauropods made their first appearance in the Late Triassic Period about 220 million years ago, then rose to prominence during the Late Jurassic, growing to 80 tons or more. The Jurassic giants gave way to the titanosaurs in the Cretaceous, a group that thrived until 65 million years ago when a major extinction event wiped out all the mega-fauna dinosaurs. Osteoderms in a modern reptile: Bumps of bony armor seen embedded in the skin of a Gila Monster (Heloderma sp. )Courtesy Fritz Geller-Grimm via Wikipedia Creative CommonsNow an assistant professor at Macalester College in St. Paul, Curry Rogers' latest research centers on titanosaur osteoderms. Osteoderms are bony deposits embedded in the skin and used as defensive protection or for other functions such as temperature regulation. 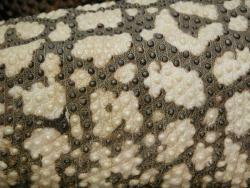 The bumpy armor can be seen today in alligators, crocodiles and many other reptilian forms (see photo). So far, titanosaurs are the only sauropod dinosaurs known to have had osteoderms.The smaller ornithopod dinosaurs such as ankylosaurs and stegosaurs used osteoderms to create bony exteriors to strengthen their hide against attack. On the predator side of the equation, the carnivore Ceratosaurus is the only theropod dinosaur found with osteoderms. Curry Rogers has been studying the osteoderms of two titanosaur specimens (Rapetosaurus krausi), one from an adult and the other from an immature individual. Both specimens were found in the 1990s in the sandstones of the Maevarano Formation exposed on the northwest corner of the island of Madagascar. During the Late Cretaceous the climate in the region was seasonal with periods of rain and drought alternating with periods of semi-arid conditions. Heads up: Rapetosaurus krausi stands before Charles R. Knight's classic rendition of its Jurassic ancestor, ApatosaurusCourtesy Mark Ryan That a 50-foot adult Rapetosaurus would even need osteoderms at first mystified the paleontologist. A full-grown Rapetosaurus was just too enormous to require body armor. The new data made the paleontologist wonder. Why would the osteoderms appear one way in an earlier life stage and change into another form in adulthood? 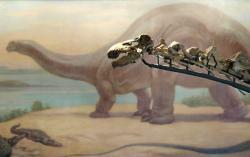 Did their functions change as the titanosaurs passed through different stages of life? Eventually the paleontologist came up with a hypothesis: the osteoderms were probably used as armor when the Rapetosaurus was small and still growing, and easy prey for predators. But as it neared adult size the osteoderms were no longer needed for protection and instead could have served as reservoirs for minerals, such as calcium and phosphorus. These would have been useful as the dinosaurs' size increased or when the adult titanosaurs needed extra minerals during times of environmental stress (like the frequent droughts occurring on Madagascar during the Late Cretaceous). Drawing minerals from its arm or leg bones would have weakened them making it difficult for the multi-ton animals to stand or walk. The mineral stores could also be used during reproduction when calcium was necessary for egg shell production. Curry Rogers and her colleagues have published their findings in the online journal Nature Communications and can be downloaded here. Man, I don't know. Because "dinosaur feathers" sounds lot like "horse feathers," and no one in the history of humanity has ever uttered "horse feathers" without also shouting "yee-haw" in the same five-minute window. And because dinosaurs and their feathers are exciting, so why not toss a little yee-haw in there. It doesn't matter, really. What matters is that you check out all these cool images of Cretaceous period feathers preserved in amber. There's been a whole lot of buzz on the internet recently about Brontomerus mcintoshi, a giant sauropod dinosaur with unusually large hips (and somewhat derogatory name translation) discovered more than a decade ago in eastern Utah. In this video, British paleontologist Mike Taylor explains the hows and whys of "Thunder Thighs". Hey that rhymes. You can read even more about Brontomerus over at Taylor's Sauropod Vertebra Picture of the Week (SVPoW) blog. The fossil remains of a giant five-foot penguin has been unearthed in Paracas National Reserve, a desert region along the coast of Peru. The new species, named Inkayacu paracasensisI (water king), grew to a size nearly twice as large as the modern day Emperor penguin. The nearly complete fossil even skeleton included flippers and feathers. Some color of a bird's feathers can be deduced by the size of the melanosomes in its structure and by their shape and arrangement. When Inkayacu's melanosomes were compared with those of modern day birds, the nanostructures indicated that the giant penguin's feathers were reddish brown in color. "Before this fossil, we had no evidence about the feathers, colors and flipper shapes of ancient penguins," said paleontologist Julia Clarke, of the University of Texas, and lead author of the report that appears in Science. The new evidence brings up new questions. For example, Clarke and her team aren't sure when or why the feather colors of most modern penguins shifted to black and white. I. paracenensis lived during the Eocene epoch 36 million years ago, and its fossil has been nicknamed Pedro. "Reporting in the Proceedings of the National Academy of Sciences, researchers describe a new predatory dinosaur from the late Cretaceous period in Europe. Balaur bondoc (Romanian for "stocky dragon") is huskier than its closest relative the Velociraptor and has unusual feet." Seems like some of them were never here to begin with. 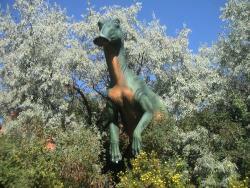 Over the years, scientists have named about 700 different species of dinosaurs. But a recent study indicates that perhaps as many as a third of these were phantoms—specimens that were given distinct names despite actually belonging to another, well-known species. For example, Torosaurus is now thought to be just a fully mature version of Triceratops. At the other end of the age scale, Nanotyrannus is considered by some to be just a juvenile form of the famous Tyrannosaurus rex. But don’t be too hard on the poor paleontologists. Other scientists have this same problem. Last year, it was reported that over 30% of all living marine creatures had been misidentified, and for the same reasons. An individual (or small group) was slightly larger than normal, or slightly smaller, or a slightly different color, or came from a different location—enough to lead the scientist to classify it as a new species, when in fact it was already a member of an established species. If taxonomists can make that many mistakes with living creatures, we shouldn’t be surprised that the dinosaur family tree will need a little pruning. The lead story of Sunday's Star-Trib travel section is about a travel opportunity in Wyoming where families can help dig for dinosaur bones. While time is dwindling down on this summer, it's a vacation destination to keep in mind for next year. BTW: I know the author of this story and warned her that too many trips like this might lead her kids to actually working for a museum!!! 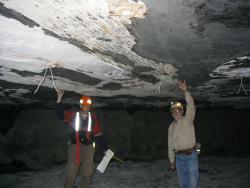 Huge underground fossil rainforests discovered in Illinois coal mine. 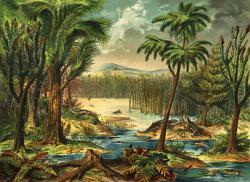 Illinois landscape, 300 million years ago: Late 19th Century illustration portraying a Carboniferous rainforestCourtesy Mark RyanLast year, news came out about the discovery of a large fossil forest dating from 300 million years ago in a coal mine located in eastern Illinois. Now, five more prehistoric forests have been identified in the same region. Central Illinois above the coal mine: The terrain and vegetation today is a far cry from how it looked 300 million years ago.Courtesy Illinois State Geological SurveyThe remains of the ancient tropical rainforests cover a tremendous area – 36 square miles – and have been under study by scientists from the Smithsonian, the UK, and the Illinois State Geological Survey. A presentation given at the British Association Science Festival held in Liverpool this week detailed some of the highlights of this incredible find. "Theses are the largest fossil forests found anywhere in the world at any point in geological time,” said Dr Howard Falcon-Lang a paleobotanist at the University of Bristol. The prehistoric landscapes existed within only a few million years of each other – a short span geologically speaking – and are found stacked one upon the other. Segments of the forest fossilized in their original vertical position. At places, scientists can trace the original ground cover in well-preserved fossils. Donning cap lamps, battery packs, and rock hammers Falcon-Lang and his colleagues rode an armored vehicle 250 feet beneath the Herrin coal seam in the Riola and Vermillion Grove coal mine. Once underground, the scientists took an incredible hike through a long-gone prehistoric fossil forest, illuminated only by lights on their caps. Fallen fossil tree in coal mine: Howard Falcon-Lang (University of Bristol) and John Nelson (Illinois State Geological Survey) mark off the width of a large fossil tree trunk lying just above the contact of the coal bed.Courtesy Illinois State Geological SurveyIn some cases toppled trees – complete with crowns – and over 100 feet long were measured lying stretched out in the shale across the ceiling. For paleobotanists it presents a remarkable opportunity to actually stroll through a 300 million year-old ecological system as if taking a walk in the local woods today. The reason for this unusual preservation is thought to be due to the prehistoric rain forest growing in an estuary near the Royal Center fault in Indiana, which caused the terrain to subside below sea level making it vulnerable to incidents of flooding and abrupt drowning. Geologists suspect earthquakes along the fault are the reason for the subsidence. 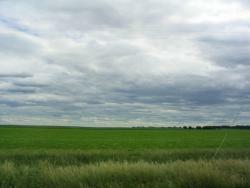 The soil that once supported these rainforests was later transformed into coal. 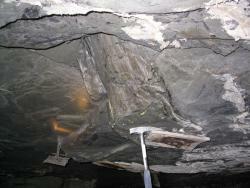 Once this coal seam was mined from underground, the base of the fossilized forest was revealed encased in a shale matrix. These tropical rain forests originally flourished during the Pennsylvania period (known as the Upper Carboniferous in Britain), back when the US Midwest was located near the equator. Forests of giant club moss trees and tree-sized horsetails came and went over a geologically short span of time. At the same time, major shifts in climate were taking place, alternating from cooler temperatures with large planetary ice caps to periods of extreme warming. The episodes of climatic change coincide with changes in the forest ecology. Close study of the fossil vegetation show that several times the climatic stress pushed the rain forests into extinction, making way for skimpier fern growths to replace them. Over the next five years Dr. Falcon-Lang’s team will search for reasons why this rainforest extinction took place. Understanding how the first rainforests responded to global warming could help shed light on how climatic change may affect present day rainforests. Additional photos of the amazing fossil forest can be found here. But if you want to see some of the real thing, visit the coal-mining exhibit at the Museum of Science and Industry in Chicago where an actual slab of the gray roof shale is on display. Well I'll be! 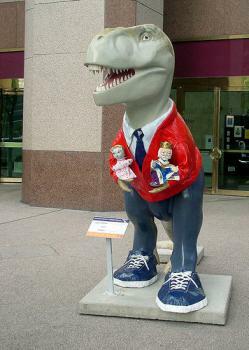 : A dinosaur on a bus.Courtesy T-Oh! 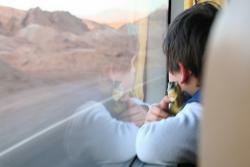 &amp; MattPeruvian officials discovered a 19-pound dinosaur jaw bone the cargo hold of a bus this week. The bone appears to be from a triceratops, or one of its relatives, although such dinosaurs have never been found in Peru before. More perplexing to scientists, however, is the prospect of a population of dinosaurs living and dying in a bus's cargo area. Edmontosaurus: Not an actual Edmontosaurus. But the real one that's being dug up will help us learn how accurate this one is.Courtesy russilwvongResearchers at North Dakota’s state museum are unearthing a 65-million-year-old rock, using tiny brushes and chisels to uncover a nearly complete dinosaur fossil, with skin and all.